We maximize business value by helping clients develop strategies for risk management, owner team structure & staffing, contracting & procurement, and project delivery. Our expertise spans many industrial sectors. With more than 20,000 projects of all sizes executed across the world, IPA’s proprietary databases drive its research and analysis. Founded in 1987, IPA is a benchmarking, research, and consulting organization devoted to the empirical research of capital projects and project systems. Many refining and transportation companies spend millions of dollars annually on their tank maintenance. Because these projects do not generate revenue and often require the tanks to be taken out of service, executing maintenance work efficiently is vital. Yet, most companies rely on simple rules of thumb to develop new estimates. Working with a number of leading companies, IPA collected data on over 100 tank maintenance projects. We developed $/barrel curves by product (crude, gasoline, diesel, and others) and activity (cleaning, inspection, repair, painting/coating, and more). We also developed metrics for schedule durations and cost and schedule predictability (delivery of project vs. budget/plan). Companies can use the charts to compare their historical tank maintenance projects and to better estimate the cost and schedule for their new projects. The overall goal of the study is to help companies optimize their cost and schedule competitiveness for these important, frequent projects. Cost per barrel ($/BBL) plateaus earlier than some companies anticipate—after tank size exceeds 100,000 barrels, the economy of scale flattens out. The relatively early plateau is true for each major activity that IPA evaluated (inspection, repair, etc.). 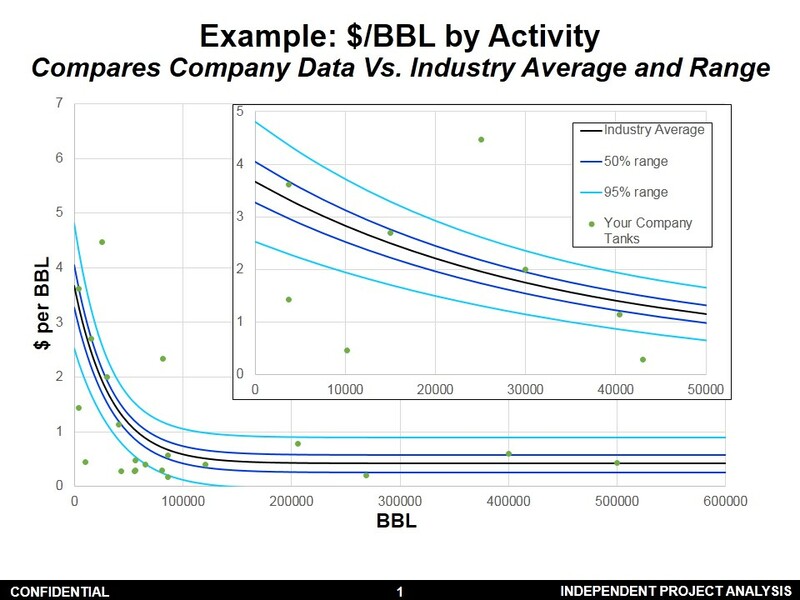 The first graphic to the right provides an example of how the $/BBL trends were presented, and how each company’s data points were compared against the industry curve. As a whole, these projects tend to underrun their budget, on average, but predictability varies significantly by activity. For example, inspections and bottoms processing is often more costly than estimated. In contrast, most other activities (cleaning, repair, etc.) tend to meet their estimated cost or underrun slightly. 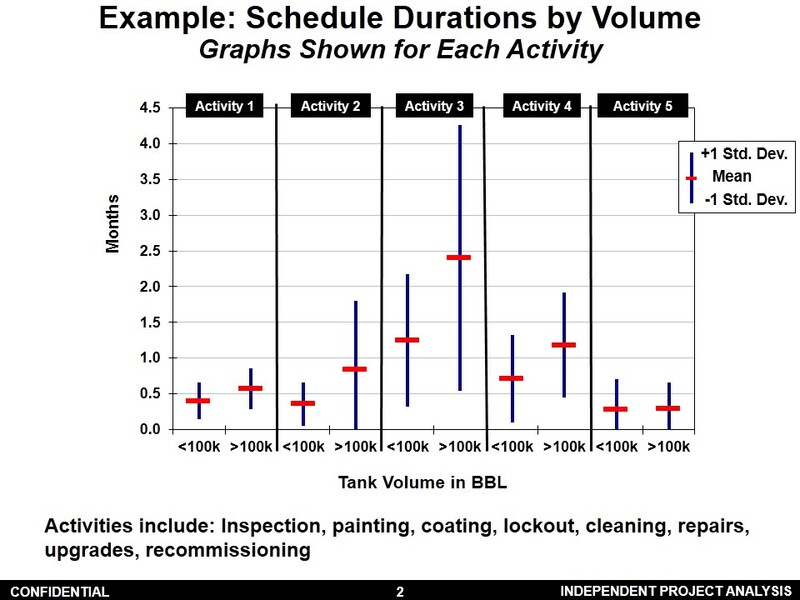 Although many tank maintenance projects are said to be schedule driven, the schedule durations are quite variable. Although tank maintenance cost correlates quite closely with tank volume, tank maintenance schedules are better predicted by factors such as total cost of the work and tank diameter, as indicated in the second example graphic. The study remains open to new participants. Contact Phyllis Kulkarni to join or to receive additional information. About IPAFounded in 1987, IPA is the world’s leading advisory firm on capital effectiveness. We provide research, benchmarking, and consulting services to improve the performance of our clients’ capital projects and project systems. © 2019 Independent Project Analysis, Inc.